Are you a resident of the city of San Antonio? For a limited time only, receive a $279+ value Rachio 3 Smart Sprinkler Controller and $169+ value Wireless Flow Meter package with purchase of discounted installation (normally $500). This $900+ value offer is available to approved San Antonio residents for just $99. What is the SAWS program? In partnership with San Antonio Water System, this limited-time program encourages homeowners to maximize watering efficiency and leak detection with the Rachio 3 Smart Sprinkler Controller and Rachio Wireless Flow Meter. The complete Rachio Smart Water System is free to you with purchase of a discounted $99 professional installation (a $900+ value!). If you received an email from San Antonio Water System (SAWS) that you are eligible for a Rachio 3 Smart Sprinkler Controller and Wireless Flow Meter, you're in luck! Read on for details on this special offer. What can you do with the Rachio Smart Water System? The Rachio 3 Smart Water System brings together leading smartphone sprinkler control, advanced Weather Intelligence™ Plus, and precise flow monitoring to help nurture a beautiful yard and protect against leaks. There is a very limited quantity of free Smart Water Systems and discounted professional installations available; claim yours before they're gone! The Rachio 3 Smart Sprinkler Controller raises the smart watering bar with easy installation, dual-band Wi-Fi and an expressive light bar. Rachio 3 is the only controller equipped with hyperlocal Weather Intelligence™ Plus and Rachio Wireless Flow Meter compatibility. Rachio Wireless Flow Meter technology monitors outdoor water-use, halts costly leaks and protects your landscape from damage. The Flow Meter pairs seamlessly with Rachio 3 and the Rachio App to uncover patterns or problems in the pipes below. It detects leaks with highly-accurate Vortex technology and instantly alerts at the first sign of trouble. We’ve partnered with Andy’s and ARS, locally Rachio-trained companies, to provide professional installation. Our installation partners will provide the Rachio 3 Smart Sprinkler controller, optional weatherproof outdoor enclosure, Wireless Flow Meter, and required flow meter fittings at your installation appointment. No, you must purchase a discounted professional installation for $99 (a $500 value) to receive your free Rachio 3 Smart Water System. We’ve partnered with Andy’s and ARS, locally Rachio-trained companies, to provide professional installation. To preview the installation steps, go here or check out the installation resources listed above. 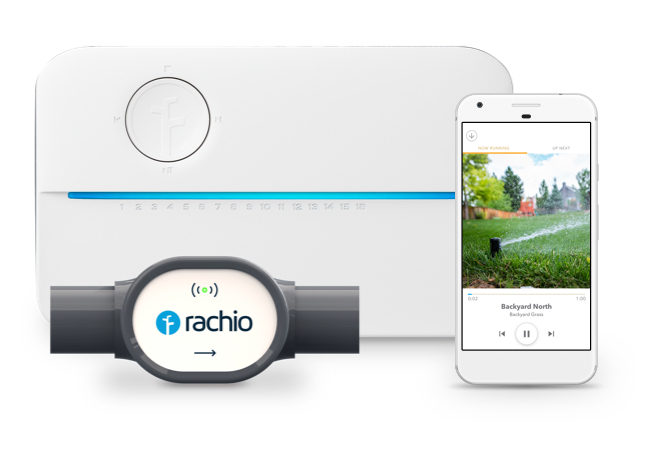 When installed professionally through the SAWS program, the Rachio 3 Smart Sprinkler is eligible for an extended four-year warranty and the Rachio Wireless Flow Meter is eligible for a two-year warranty. For more information on the Rachio warranty policy, go here. Yes, this is a legitimate partnership between Rachio and San Antonio Water System (SAWS). For details, you can see more at go.rachio.com/saws/. Eligible customers are required to meet and comply with certain criteria in order to participate in the program. San Antonio Water System will confirm eligibility based on the following conditions, and as otherwise determined by SAWS, to preserve the safe operation of SAWS water system and system components. receive training from the installation contractor, and consent to a post-installation verification, if requested by Utilities. Need to reschedule or cancel your appointment? You can reschedule your appointment within your confirmation email. Locate the appointment time within the email, then select "Cancel/Reschedule" and follow the instructions.